The royal blue Godolphin colours are familiar all over the world and in the 20 years since they were registered with the British Horseracing Authority they have had huge success many different countries. 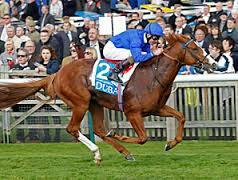 At the moment, Dawn Approach, trained by Jim Bolger, is at the forefront of Godolphin thoughts, and it’s the fact that he is trained in Ireland that could have led him to have to run in different colours if he were to race there. The revival of the colours proved successful last week, again at Roscommon, as the rather unlikely named Protestant just put his nose in front on the line in a ten-furlong maiden race. Perhaps the Coopers hope that some of the Godolphin magic will transfer across to their horses. On the other hand, they may not need it, as BBA Ireland has a long history of either purchasing or managing top quality horses, including 1962 Derby winner Larkspur, and more recently, 2010 Oaks winner Snow Fairy.